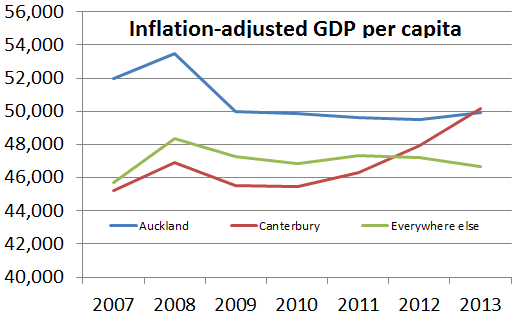 It’s a pretty simple image: Auckland has been about treading water, every where else is starting to go backwards, and the only thing that is giving the economy an illusion of growth is the money going into the rebuild in Christchurch. There are few things to comment on about that. Firstly, imagine how much better the Canterbury figure – and thus, the economic fortunes of the whole country – would be if the rebuild was being managed even half competently. The Government’s blueprint is a failure, with the only development in the city happening outside of the areas that are in control of CERA. The play which the government made for foreign investment has returned almost nothing, leaving development up to a handful of almost comically rich Cantabrians. It’s no wonder that investors are looking elsewhere, when the cost per metre for office space is more expensive in a city which looks like Post-Tito Yugoslavia than in the centre of Auckland. Secondly, if New Zealand’s economy is a “rock star”, it is one that has drunk the contents of the minibar, soiled the bed, and thrown the TV through the ranch slider and into the pool. Now the hotel is getting new sheets and some double-glazed windows on insurance, but that isn’t the structural change that it needs. 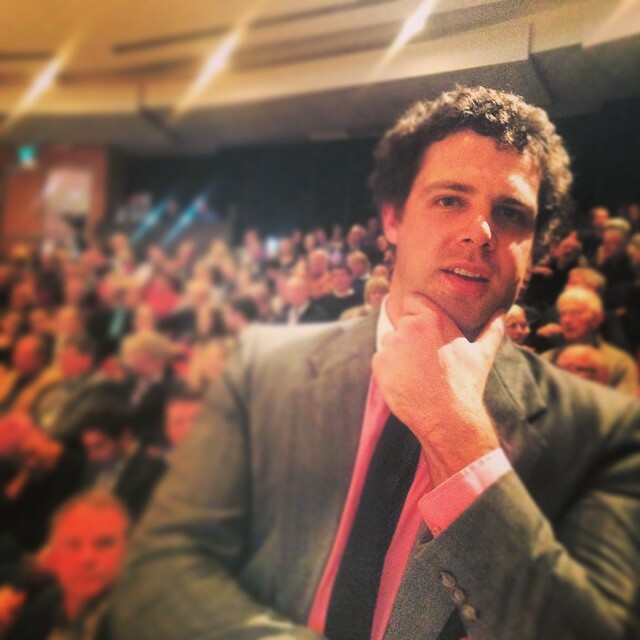 With the National Party’s self-proclaimed economic expertise – hand-outs to multinational companies with billion dollar balance sheets, a sad interdependence, both economically and politically, on the dairy industry, flogging off state owned assets to paper over the cracks in the budget – their economy is effectively based on fixing some broken windows in a city destroyed by a natural disaster. If they’re a “safe pair of hands” for the Treasury benches, then I’m a heritage building crying out for demolition. Very interesting piece from Christchurch architect John Chaplin on the uncertainties of the residential rebuild program. He warns that we may not have learnt anything from the leaky building saga. There are two interesting stories in the Press this morning that show the complete shambles that the rebuild of Christchurch has become. The first is about the escalating costs of construction. Worryingly, it suggests that due to rising costs, developers are eschewing fancy designs and pumping for plain old tip slab instead. Central city developers are having to compete with buildings in Addington, Victoria St and out at the airport, where the land is cheaper, and foundations are cheaper to put in. For the developers in the central city, this means that to build a premium office space, they are having to pay more than anywhere else in the country. Think about that for a moment. Yes, we need to ensure that the buildings here are safe for future seismic events. But the buildings going up in Addington and Victoria St aren’t the most expensive in the country; this is a clear by-product of the CCDU blueprint, which deliberately restricted land supply for a select few developers. So while the plan was to artificially maintain the property prices for the lucky few, if they can’t afford to build on this land, it will soon lose it’s value again. Who is going to want to move their law firm into the most expensive office building in the country, when it is in the centre of a grey, broken wasteland, pockmarked by the occasional tilt-slab barn? The government should never have tried to prop up the property prices of their favourite developers; they should have let their beloved market determine what land was worth in the centre of a devastated city. That said, very little is happening in the middle of town, it wouldn’t be too late to just scrap the plan and start again. Worryingly, the cost of building is expected to go up when they actually get around to starting it. David Wallace, who represents developer Devonia Holdings, expected costs would “ramp up further” once the city’s anchor projects began. Ah yes, those “anchor projects”, like the stadium. The damned stadium. But wait, the stadium could *make* money, according to a new plan. Geoff Saunders, a lawyer who seems to have the ear of Brownlee, has pitched the idea of building office blocks into the stadium. Ok. He reckons they would make $11 million a year. Ok. This raises more questions than answers for me. First, who is building these office blocks? This relates to the question who is building this stadium, and who is funding it? This is a question that people have been asking ever since the blueprint came out. It seems that the government is going to force the council to build it, and force the ratepayer to pay for it. If that’s the case, and this is the design, then will the ratepayer then be expected to build office blocks too? You would have to assume that they were going to be built by the council, as otherwise, the purported $11 million would not be returned to the people. If they were built by another operator, and their value was contingent on their proximity to a publicly-funded asset, then why would we let them take the money? But probably the biggest question I have on this is contingent on it’s success: if you can generate $11 million a year from 4 office blocks on this site, then how much could you generate if you just built offices, not a stadium? The jury is still out on whether Lancester Park can be salvaged, and no-one has produced a costed economic plan for the stadium. Looking at the picture that accompanies the story, I reckon you could fit 15 of these office blocks on the site; using the same maths as Saunders, this would pull in around $40 million a year. Also, you wouldn’t have to needlessly destroy heritage buildings like the NG Gallery one. You could even include some social housing in there, and bring some people back into the central city. I realise that this is never going to happen; however, I think it’s important to bring the keep highlighting the idiocy that is the CCDU blueprint and all it’s unintended, yet highly predictable, consequences. Gerry Brownlee has just released a statement on the legistlation that the government will pass to help with the recovery and rebuild. The government will introduce legislation tomorrow to facilitate recovery work in Canterbury, says Gerry Brownlee, the Minister responsible for coordinating the Government’s recovery response to the Canterbury earthquake. “Canterbury has been under a state of emergency for nine days following the earthquake. When the state of emergency is lifted, normal legislative requirements come back into force,” Mr Brownlee said. “The building, local government and resource management acts are not designed for the special circumstances Canterbury faces. We don’t want recovery work being slowed or stopped by filling out paper work. That is why the government is introducing the Canterbury Earthquake Response and Recovery Bill, to allow a seamless transition from the state of emergency. The legislation will expire no later than 1 April 2012 and enables the government to use orders in council to ensure recovery operations can occur efficiently and without delay. It also creates a commission that includes the mayors of the three worst-hit districts – Christchurch, Waimakariri and Selwyn. The Canterbury Earthquake Recovery Commission will link decision makers on the ground in Canterbury directly with government Ministers. “The state of emergency has allowed authorities in Canterbury to make decisions and act quickly in response to the calamity they faced. “They have done well and the emergency state is passing. Special legislation is needed to ensure recovery work continues at pace,” Mr Brownlee said.